Limasha Asangi Uggalla began her primary education in 2006 from Dharmapala Vidyalaya, Pannipitiya. She showed signs of great potential in many fields from a young age. One of the earliest signs she displayed signs of her leadership skills was when she was chose to lead Little Friends at her school. 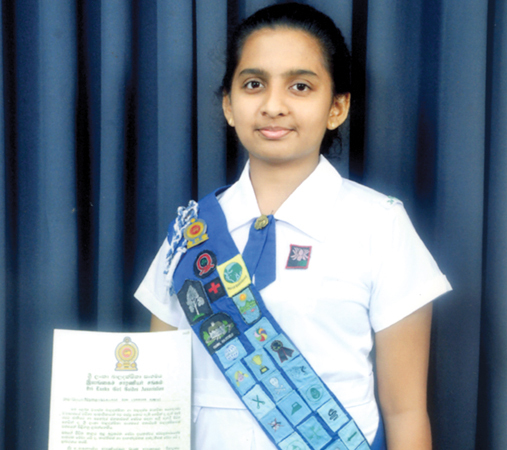 Under Manori Hettiarachchi’s guidance the young lass joined Girl Guides in 2012. She became a member of the Sri Lanka Girl Guides’ Association and completed all her chores and duties successfully. She was also awarded Pahimpath as a Kandyan dancer. She was also a senior prefect at her school and a member of the school western band. Not limiting her talents to the academic sector alone Limasha has shown great potentials in the extra curriculum sector. She received the President’s Guide Award on February 15 this year. It is the highest award that a Girl Guide can receive and Limasha was able to bestow this honour on her alma mater by achieving this goal. She entered Devi Balika Vidyalaya, Colombo, to study in the bio stream. Limasha is grateful to the former principal of Dharmapala Vidyalaya, Pannipitiya, K G Wimalasena for all the guidance and support he has given her.